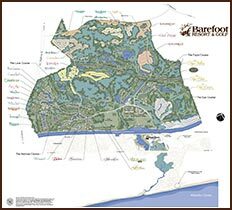 For those looking to get one of the finest luxury golf condos at a reasonable price, we recommend the condominiums at Wedgewood in Barefoot Resort. Built in 2001, these condos have been updated and upgraded to some of the nicest units you'll find anywhere. Wedgewood offers two and three bedrooms, with specials like vaulted ceilings, stone countertops, private balconies, and views of the Norman course or a pond with a sparkling fountain. There is a private community pool with barbecue area a short walk from your doorway. Prices for these beautiful condos will astound. Some two bedroom units can be purchased for just over $100,000, and the three bedrooms go up to about $160,000 when they are upgraded and have the best views. In addition, Barefoot owners can use the 15,000 sq ft saltwater pool located along the Intercoastal Waterway. An on-site restaurant is near the pool and there is "courtyard" feature with splashing fountains, piped in music, and even outdoor fireplaces in the cooler months. A seasonal shuttle service is provided to take residents and guests to the ocean and private beach cabana that belongs to Barefoot. When you live at Barefoot, you live the beach lifestyle. These golf condos also do well as rental properties. HOA fees are reasonable and we seldom hear complaints about the homeowners associations there. The Wedgewood Condos at Barefoot Resort come with our highest recommendations. Call or contact us for more information.